The Patroller Drone System from Safran’s Sagem operated very successfully in Homeland Security tests from October 5th to 8th within the scope of AIRBEAM, a European Integrated Project. As the main Surveillance System in an overall protection and intervention organisation, the Patroller Drone was operated as part of a response coordination and control unit. AIRBEAM is a European Commission project, within the scope of the FP7/Security programme. The aim is to develop a management system for large-scale crises (for example, natural disasters or industrial accidents), and to validate the system through operational demonstrations. AIRBEAM calls on the operation of several Intelligence Platforms (drones, balloons, satellites) to meet these goals, with information processed in real-time by a coordination unit. The Patroller System under test operated in Civil Airspace from the Beja Air Base in Portugal. It was controlled by Sagem using realistic Homeland Security scenarios as defined by the Portuguese National Guard and Air Force. The Patroller played a full role in all of these events, which provided full-scale Simulations of Homeland Security Missions like intrusion, convoying, surveillance of high-value sites, etc., and missions entailing population risk management (fire, accidents, contamination, etc.). In fact, the Drone's capabilities turned out to have a very practical, and unexpected purpose, since during one of its flights the Patroller detected a fire in the country at a range of more than 20 kilometers. The information on this situation that it transmitted in real-time helped coordinate the Response Teams. With this successful deployment as part of the AIRBEAM scenario, the Patroller takes a further step forward, following the demonstration of its ability to operate in Civil Airspace, based on tests in Toulouse in November 2014. These trials were carried out within the scope of flight tests for the ODREA Project, co-funded by the SESAR Programme. The Patroller's overall performance and advanced Imaging System provides very High Resolution Images to identify and precisely locate threats and risks. It has also demonstrated an ability to be deployed at short notice, plus operational flexibility and security. SESAR (Single European Sky ATM Research) is a European programme designed to modernise Civil Air Traffic Management Systems. It is financed by the European Commission and TEN-T, the Trans-European Transport Network. ODREA (Operational Demonstration of RPAS in European Airspace) is a demonstration programme for a Drone System operating in Europe's Airspace. Developed in France by Sagem, the Patroller is a Long-Endurance Tactical Drone System that complies with NATO's interoperability standards. Its open architecture means that it can support a wide spectrum of Military and Homeland Security Missions. The Drone's modular design allows it to carry a Multi-Sensor payload up to 250 kg, in the fuselage or in pods, while offering endurance exceeding 20 hours and a ceiling of 20,000 ft. Air-transportable in a standard container, it can be deployed in zones of interest on very short notice, and also take-off from unprepared fields. Sagem has demonstrated the Patroller's ability inflight to simultaneously process data from different payload instruments, including an Optronic Pod, Radar, Electronic Warfare System, Distress Beacon Detector and AIS (Automatic Identification System) Receiver. 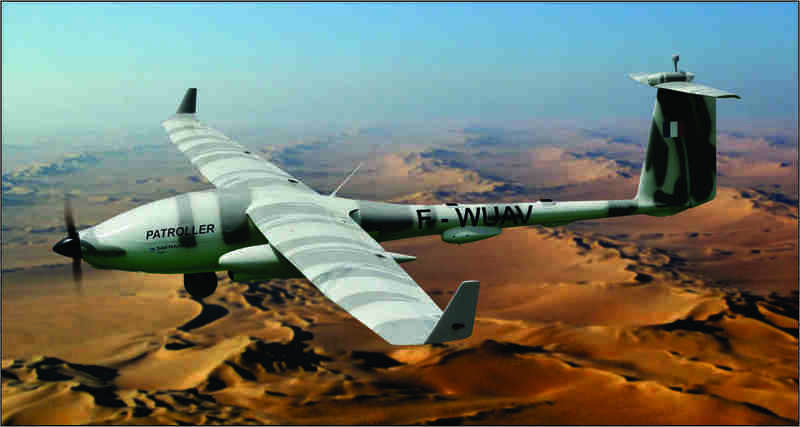 The Patroller's design draws on ten years of operational experience logged by Sagem's Sperwer Drone System in Afghanistan. Sagem, a high-tech company of Safran, holds world or European leadership positions in Optronics, Avionics, Electronics and safety-critical software for both Civil and Military markets. Sagem is the No. 1 company in Europe and No. 3 worldwide for Inertial Navigation Systems (INS) used in Air, Land and Naval applications. It is also the world leader in Helicopter Flight Controls and the European leader in Optronics and Tactical UAV Systems. Operating across the globe through the Safran Group, Sagem and its subsidiaries employ 7,600 people in Europe, Asia Pacific, North America and South America. Sagem is the commercial name of the company Sagem Défense Sécurité.